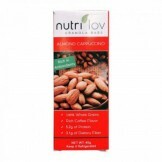 Nutrilov Almond Cappucino bar is the perfect blend of deep roasted coffee with the subtle taste of golden toasted almonds. Add in some dark and light brown sugar and what you get is a sweet crunch in every bite, just the thing to go with your tea. Offering the Nutrilov Granola Bar - Almond Cappuccino with fast shipping in Karachi, Lahore, Islamabad, Rawalpindi, Peshawar, Quetta and many other cities of Pakistan.